Almost exactly 10 years ago, I was asked to write a fundraising appeal for a foundation that was raising money for healthcare for seniors. And they wanted this appeal to arrive in American donors’ homes around July 4, Independence Day. I’m thinking of Independence Day in a different way this year. The thought first came to me when I saw the words “Independent Living” on some of our organization’s ministry materials. “Independent Living.” That’s what we’re about. Not just independence, but also dignity, purpose, and real freedom. Isn’t that what our forefathers were fighting for? True, they probably weren’t thinking of defending their right to live in a Christian retirement community, but that’s part of the beauty of their sacrifice — we have a lot of rights today that they never realized they were fighting for! 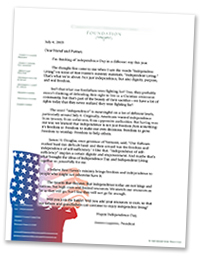 The word “independence” is meaningful on a lot of different levels, particularly around July 4. Originally, Americans wanted independence from tyranny, from unfairness, from oppressive authorities. But having won our war, we learned that independence is not just freedom from something; it’s freedom to. Freedom to make our own decisions. Freedom to grow. Freedom to worship. Freedom to help others. James H. Douglas, once governor of Vermont, said, “Our forbears worked hard this difficult land, and their reward was the freedom and independence of self-sufficiency.” I like that. “Independence of selfsufficiency” implies a certain dignity and empowerment. And maybe that’s what brought the ideas of Independence Day and Independent Living together so powerfully for me. I believe this ministry brings freedom and independence to people who might not otherwise have it. The tyrants that threaten independence today are not kings and nations, but high costs and limited resources. We stretch our resources as far as they will go, but I fear they will not go far enough. Will you join the battle? Will you add your resources to ours, so that our fathers and grandfathers can continue to enjoy independent living? Now, to be honest, I have no idea how effective this appeal was. The client did not supply me with any measured results. But I still like the wording. If you do too, maybe consider LifeLines to help with your next fundraising campaign. In the meantime, Happy Fourth!